We have a puppy named Lupe who has truly stolen our hearts. Lupe is all of 5 pounds and shouldn’t grow any larger than her current size. Lupe is what is commonly called a “designer dog” which really means that she is a mixed breed. I’m convinced that at some point in the recent past, some enterprising individual owned a pure bred dog who accidently mated with another breed and the owner had this great idea that they could convince potential customers that this was desirable, called it a designer dog and used that logic to charge a special fee for what used to be called a mutt. 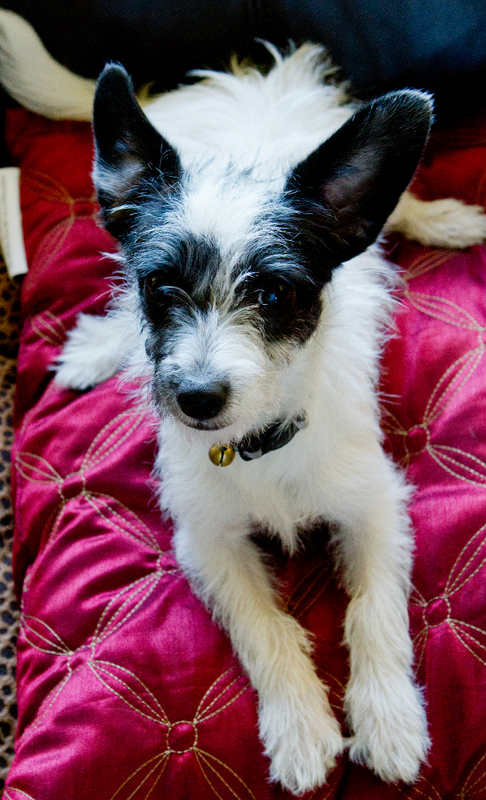 Thankfully, our designer dog was given to us by a family who was simply looking for a good home for Lupe. I would call her a mutt, but officially she’s a ChiPoo. Yes, you guessed it: Lupe is half Chiuaua and half Poodle. She is quite affectionate, but she is also quite spunky, in spite of her diminutive stature. She plays with our 50 pound German Shorthaired Pointer with complete abandon and usually initiates the play. One of her best qualities is her warning bark when a stranger is in the yard. Unlike most small dogs, Lupe is not a “yipper” – you know what I mean, that horrible, annoying, shrill yip that goes on and on. No, Lupe just gives out a single, deep “uff” when she thinks something is amiss. Of course, Lupe has her faults and she comes with all the challenges of owning a puppy. Potty training is always the biggest task, but that came as no surprise since this isn’t our first rodeo when it comes to being around puppies, and there are plenty of books available on the subject. It would be foolish of us to expect a puppy to be potty trained or to act like a mature, fully trained dog. She is a puppy, after all, and we certainly expect her to act like a puppy, which brings me to the point of this post: why are we so often surprised when unbelievers act like unbelievers? There is no other action that we can take that shows our love more to unbelievers, our enemies, than to lovingly tell them the truth of the Gospel and pray for them, while we demonstrate the peace and contentment in the midst of persecution that only comes from faith in Jesus Christ . Peter does give a warning, however, which caused me to stop & re-examine my actions: 15 But let none of you suffer as a murderer or a thief or an evildoer or as a meddler. I didn’t murder anyone or steal from anyone, but there were times when I acted in my flesh (evildoer) and I had to make sure that I had repented from that behavior and had asked forgiveness for those times when I didn’t respond in the Spirit. I agree with you about the beginnings of the designer breed. It was a very clever tactic and I have said so as well. We had a Sheprador given to us this past January, but she died of parvo about three weeks ago. Good dog, puppie and all. Destroy everything she got a hold of including my iPhone, well the Otter case anyway.